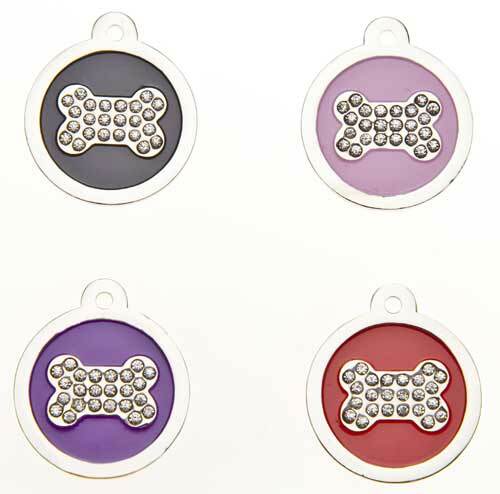 These magnificent round shaped tags are made with 24 sparkling crystals placed in the design. Base metal Brass, thickness 1.6mm and Nickel plated, Choose from Purple, Red, Black or pink. Suitable for medium and large size dogs, 31 mm wide x 36mm high and available in Red, Purple, Black or Pink. Text will ALWAYS be engraved CENTRAL on the tag. Please enter your engraving details and colour choice below before adding the item to your cart. A maximum of 3 lines per side can be engraved with up to 15 characters per line (including spaces).